I hope by now you have gotten some rest away from the classroom. Those last couple of days were doozies….Enough said. I know you know this but we teachers contribute to the craziness all in the name of a little holiday fun. I mean school is supposed to be fun..right?? Even with all the mandates I still maintain the littles need time to be kids and they really need to see that their teachers love them as kids. Here is some of our last day before the break. 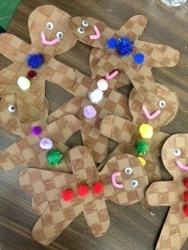 We did Gingerbread Theme Rotations with the First Grade Level on the last day. My wonderful teacher assistant and I created this big Gingerbread House in the Hallway for the kids to decorate as our part of the rotation. As each group came to our class, they got to color some candy to go on the house. The next picture is after the house is full of candy. They loved it! We also danced to Harry Kindergartens Gingerbread Man Song. After we decorated the house and had a snack we got ready to go home. We got ready early on this day because we had parent gifts to pack and our recess is the last 30 minutes of the day. I know…gasp..we have adjusted but it wasn’t any fun in the beginning. As the days have progressed our tables have gotten very dirty (oh my what you can find under a name tag-scary!!!) so it was time to break out the shaving cream. We had a blast cleaning our tables before heading outside. It was a great way to end a fun day. Kids being kids and having fun. I don’t know about you but some days I just don’t want to hear about time on task and maximizing instructional time and neither so the children. So we enjoyed every minute of this small and gross motor development task so there now. It was fun, fun, fun!!! NEWS!!! NEWS!! I am getting a new blog design and making a move to a more responsive host and site. I am so happy and I love working with my designer. I can’t wait to share it with you all. My address will still be the same so please come visit. I’m so excited to share it with everyone. We have been super busy at school! We have survived the full moon without much disruption but the holiday crazies have truly taken over! I’m so glad that there is not any rain in the forecast. 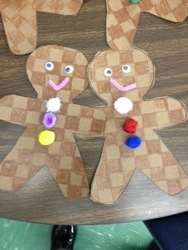 These Gingerbread Men are one of the fun crafts we have done in class. I love the checker board pattern and all of the dollar store goodies they are decorated with. I have created a giant Gingerbread house outside of my classroom. All of the first grade classes are going to decorate it tomorrow. Our class has also enjoyed this song. We also watched this video. The children enjoyed this version of the Gingerbread Man. It is a sweet retelling of the story. The children were very calm as they watched. It was wonderful. It may have been the quietest moments of the day. I kept thinking…we will make it…we will make it…I also had a constant loop of I Will Survive playing in my head. I love those kiddos!! They will be back in January ready for more learning. We teachers have to be made of tough stuff. A reader asked me to post this perspective of Newtown, Conn. It is a town the residents love and cherish. A town that is working through finding an identity that links the past and the present with grace. This will be my last post on the Sandy Hook Anniversary. Hectic Crazy Days What about you? It seems that everyone has the holiday crazies right now and if you have looked up into the same night sky we all share something else is about to happen…a full moon. Just about every teacher and everyone who works in a hospital can tell you what happens during a full moon. Why even my student teacher said “I don’t even have to look at the sky to know when the moon is full!” Smart girl…she catches on quick. Lord help and let’s hope the creek don’t rise (means hoping things don’t get much worse) What could be worse you say?? Rain!! There better not be any triple plays here in North Carolina!!! How are things where you are?? Is that Elf on the Shelf working for you? Are the holiday crazies wearing you out? My bucket of chicken I picked up sure made me feel better this evening and so did that hug I got right at the end of the school day. Little things can make a big difference!! Let me start out by saying I use I can statements in my classroom but I’m not totally convinced of their value in the classroom. Initially I loved the idea behind I can statements. Several years ago some colleagues and I were trained on using Formative Assessment in the Classroom. The presenter talked about using I can statements as motivators and affirmations for individual learners. We were told that each student could have several personal I can statements. I thought this was truly great because because it seems that over the past few years some educational settings have spent more time focusing on what students can’t do rather than what they can do! I thought how cool…Each of my darlings can have a little notebook and they can record their successes and then set learning goals for the themselves. It seemed doable. It seemed like an idea that was on the right track. Affirming student success and effort while encouraging goal setting. Well most of us know how this story ends. School districts across the country took the idea and homogenized the I can statement. Districts grappling with the Common Core made it worse. They created lists of I can statements. You can find products with I can statements written in beautiful fonts with all the colors and themes your can desire. There are lists for every grade level and every subject. This is so far from the original idea that I loved so much. I have yet to buy any products and I’m not knocking anyone who does. Most districts require them now. You can find a ton of variations on Pinterest. It shows you the great extent that teachers will go to to meet district requirements. I think also shows you how teachers just want to teach students in a meaningful way. We will put the I can statements up but we know that there is a lot more to learning than placing the statements on the wall. Example of the many I can statement products available to teachers. I’m sure these are great products and are meant to help teachers. For now my I can statements are written in dry erase maker on the board. I try to personalize them for our class and where we are in a unit of study. We have been told we must have them up in the classroom. It doesn’t really matter if they add value to the instruction they just need to be on display. I do use them with my students. I try to turn them into manifestations of success. “Yes you can!” I say. I said that anyway before I can statements became fashionable in educational circles. I know many of you believe in the power of the I can statement. I would love from all of you about I can statements. Are they adding educational value in your classroom? Are you posting them because you must? Have you learned to love the I can statements you have to work with? Please comment. I look forward to the discussion. Why is the dog in the plastic container? Why would the dog stay in the container? How would being together help the man and his dog? How can you care for older companions?